~Football season is officially underway. Schedules have come out, and tickets are already changing hands. Airfare is being purchased, and hotel rooms booked. Packer Nation has already started to make vacation plans to Florida, Nashville, Georgia, Washington, DC, and the city of Brotherly Love. This is in addition to the normal games in Motown, the Windy City, and the Twin Cities, as well as Green Bay. Don’t be afraid to book Houston though. What does this have to do with the Packers 2016 schedule? A year ago, I thought the Packers were set to make history, or at least a run at it. I thought 16-0 was a realistic goal. But then Jordy Nelson‘s ACL changed everything. Now? He should be back. He could be. But how much will he resemble the same #87 we were used to seeing? Most players aren’t the same ever again, and those who are close, aren’t usually over 30 years old, and it usually takes them a “practice” season to get the rust off and the feeling back, physically and mentally. Adrian Peterson was basically the exception a few years ago, but he was still about 26. And we of course don’t yet know who Ted Thompson will draft. Last year, adding Damarious Randall and Quinten Rollins helped the team immediately. Ty Montgomery helped a little bit too, until he also got hurt. Most likely, Thompson will find one difference-maker in the draft, hopefully at inside linebacker or on the defensive line. He already added an upgrade at tight end with the under-achieving, but talented, Jared Cook. Despite all that uncertainty, the main part of the team, and all other teams, is pretty established. So let’s take a look at each game and what we can expect. Week 1: Sunday, Sept. 11 at Jacksonville Jaguars, 12 p.m. This is a tricky opener for the Packers as they rarely play games in weather this hot. Well, at least since being in the NFL. The Alabama, USC, UCLA and ASU guys like Eddie Lacy, Clay Matthews, Datone Jones, Nick Perry, Damarious Randall, Carl Bradford and others had plenty of hot weather games in college. 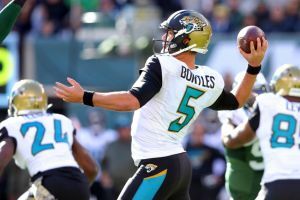 Expect the Jags to be sporting their white unis to force the Packers to wear their dark greens in the near-90 degree Florida sunshine. The average high temperature in Jacksonville on September 11th is 88 degrees. The Packers withstand the heat and the fine passing attack led by Blake Bortles, to win 31-23. Week 2: Sunday, Sept. 18 at Minnesota Vikings, 7:30 p.m. The Packers will be the guest for the first regular-season game at the new U.S. Bank Stadium in Minneapolis. The Packers prove to be rude guests, as they were last year in the Gophers stadium when the Packers put a thumping on the favored Vikings. The hype will be the debut of the Vikings brand new, expensive stadium, but this is a very important early game in the NFC North. Packers smother the Vikings anemic offense of Checkdown Teddy, 27-6. Viking fans start to wonder if Bridgewater really is a QB who can lead them to a Super Bowl. Of course not, nobody can, since Fran Tarkenton left. Week 3: Sunday, Sept. 25 vs. Detroit Lions, 12 p.m. The Lions ended a 24-year victory drought in Wisconsin by beating the Packers at Lambeau Field last year. Of course, the Bears and Vikings also shockingly won at Lambeau last year. 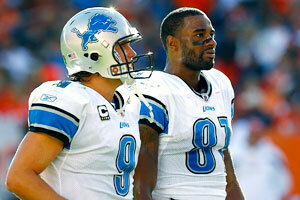 That was with Calvin Johnson, who will be watching this one from his couch at home as he’s wisely called it a career. Matthew Stafford is going to miss #81 more than he can imagine. Packer DB’s won’t. This year, things return to normal at home. Packers whip the Lions, 41-10, as the offense starts to roll and the defense continues to punish opponents. Week 5: Sunday, Oct. 9 vs. New York Giants, 7:30 p.m.
Former Packers assistant coach Ben McAdoo returns to Green Bay as a first-year head coach for the Giants. He spent eight years working for Mike McCarthy in Green Bay before leaving in 2013 to become the Giants’ offensive coordinator. 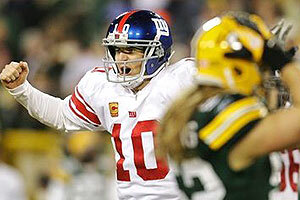 Eli celebrates his lucky Hail Mary back in the 2011 NFC Divisional game to end the first half. It’s either a Super Bowl or a crappy season for Eli and the Giants. Eli and the Giants have had the upper hand on the Packers and Rodgers recently. But not this Giants team, or Packers team. But the game will be close, on prime time for the second time in three weeks. Packers win 27-23 behind two big returns from rookie Jakeem Grant, including one for a touchdown following a Giants field goal. Coach McCarthy completes a perfect “first quarter” to his season. Week 6: Sunday, Oct. 16 vs. Dallas Cowboys, 3:25 p.m. This is the sixth game against the Cowboys in the past eight years, including playoffs, and the Packers have won the last five. 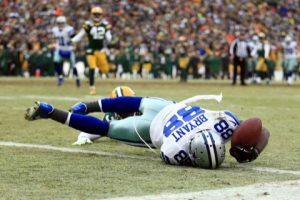 Bitterness still persists from Dez Bryant and Cowboy fans alike over the playoff loss in January 2015. Dez still thinks he caught this. You know what, all of you thought it was a catch when if first happened, until replays and the questions about the wacky definition in the rulebook. Last year, both Romo and Bryant were shut down by week five, as was Nelson of course. Let’s hope all the key guys on both teams are healthy, so that this game will be a good one. If so, I see the Packers winning 34-24. Week 7: Thursday, Oct. 20 vs. Chicago Bears, 7:25 p.m.
Get ready for the color-rush game. Like all teams in the Thursday night games, the Packers will wear alternate uniforms with one dominant color scheme. Fans of both teams remember the game last year on Thanksgiving night when the Packers retired Favre’s jersey, in the rain, then went out and lost a game to the Bears, which is rare. With Clay Matthews set to move back to his best position, OLB, this might be a common site yet again. Rodgers had four shots into the end zone inside the 10-yard line over the last few seconds, and Jones, Cobb, and Adams were unable to beat linebackers and get open for a game-winning catch. That all changes this year with Nelson back and Janis inserted. Packers roll as we used to expect in Lambeau against the Bears. 35-10 Packers. Week 8: Sunday, Oct. 30 at Atlanta Falcons, 12 p.m. The Packers have won four straight, including playoffs, against the Falcons. Remember 2008, when both Matty Ice and Aaron Rodgers were just starting their careers? Atlanta would have the edge, until 2010 when Rodgers elevated into a Superstar. The Superstar. The man. 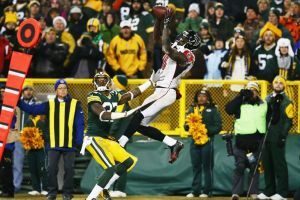 When these teams last met, in 2014 at Lambeau, Julio Jones had about 20 catches and 300 yards. The Packers may have lost that game had he not gotten injured and forced out late in the game. This is the kind of trap game the Packers have lost a few of in the past, including at a bad Saints team two years ago, and at Buffalo two years ago. I don’t like to forecast losses. And Rodgers doesn’t like to lose in Atlanta. Packers win a good game, 27-24. Week 9: Sunday, Nov. 6 vs. Indianapolis Colts, 3:25 p.m.
Andrew Luck threw for 362 yards in his only game against the Packers, a 30-27 win in 2012 in Indy. This was a game the Packers had control of, but the zebras helped Indy back in the game when they took away a strip-sack of Luck by Nick Perry. The only previous meeting against Andrew Luck, the Packers were on their way to a blowout, about to be up 21-0, when the bottom zebra decided to throw his hanky. The ref closest to the play knew it was a legal hit. Then Reggie Wayne went nuts on the Packers. I expect a close game again here, but no help from the zebra this time, and Rodgers evens his head-to-head record versus the Stanford rival. Packers 34-27. Luck throws for 450 yards, as Phil Rivers did last year. But like then, Packers prevail in a thriller at Lambeau and complete quarter number two with another perfect clip. Week 10: Sunday, Nov. 13 at Tennessee Titans, 12 p.m. The Packers will be seeking their first victory at the Titans since they moved to Tennessee in 1997. Marcus Mariota and Demarco Murray lead a ground-oriented Titans offense. They have (had) the number-one overall pick for a reason: they’re still not a very good football team. But with all the picks they got from the Rams in the trade for the top pick, plus the addition of Murray, this should be an improved team. I like him, but I definitely fear Mariota’s legs more than his arm. Mariota might run for 100 yards on the Packers, as the young Colin Kaepernick did. But it won’t be enough for Tennessee as they don’t have the 2012 San Francisco defense. Packers win their ninth straight game to remain perfect, 30-17. On the East Coast, the Patriots are also undefeated, and ESPN is now devoting 14 hours a day hyping the upcoming Super Bowl of the Packers versus the Patriots, as we all expected in 2007, 2011, and 2014. Week 11: Sunday, Nov. 20 at Washington Redskins, 7:30 p.m. This is a revenge game for the Redskins as the Packers blew out the Redskins 35-18 after falling behind 11-0 to start the game. The Redskins record last year was inflated as they beat all losing teams, none with a winning record all year. You like that!? While I like Cousins, I think he was kind of a one-year fluke, as we’ve seen from some other NFL quarterbacks before. Week 12: Monday, Nov. 28 at Philadelphia Eagles, 7:30 p.m.
Like Ben McAdoo in New York, here’s another new head coach who has long ties to the Packers. First-year Eagles coach Doug Pederson was Brett Favre’s long-time backup. 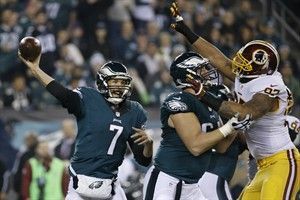 Who knows who the Eagles quarterback will be for this one, perhaps Sam Bradford. But he’s due to be injured this season, and they may take a QB high in this particular draft. We still don’t really know who Sam Bradford really is. For Philly, that’s not really good to still wonder who he is. We know it won’t be Mark Sanchez as he’s in Denver now. Philly still has some talent on defense, and Darren Sproles can still hurt the Packers on special teams. Nonetheless, Packers roll on prime time yet again, 37-9. Undefeated season remains…..
Week 13: Sunday, Dec. 4 vs. Houston Texans, 12 p.m.
Wisconsin native J.J. Watt gets to play in Lambeau Field for the first time in his career. It’s too bad this hasn’t been his home field for his career. How can you not love this guy? Still, I predict his play starts to decline a little bit as injuries start to take a toll on Watt. This will probably be his one and only time playing at Lambeau Field. Fatigue might catch up with the Packers on a short week after three straight on the road. But I don’t believe in Brock Osweiler and I think Houston will be no better than a .500 team once again. Packers trail at the half, but open it up in the third quarter and pull away 27-17. Week 14: Sunday, Dec. 11 vs. Seattle Seahawks, 3:25 p.m.
Last week it was former Badger J.J. Watt. 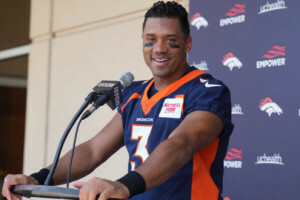 This week, it’s former Badger quarterback Russell Wilson. But this isn’t Wilson’s first trip to Lambeau as the Packers beat him last year in week two on prime time. This one might be flexed (almost for sure it will, unless it’s able to be protected by Fox) to prime time as well, which would be the Packers sixth under the lights. No more Beast Mode Marshawn Lynch, but Russell Wilson is still a dangerous QB, both with his running and throwing. This was a great game last year won by the Packers. If the Packers are going to lose at home, this will be the game and team. Because I do not want to jinx the Packers as I did last year, I’m penciling in a loss in this game on a missed Mason Crosby 47-yard field goal as time expires. I believe a loss here could help in the long run as the Packers will have gotten too confident, as they were in 2011 when they were 13-0 thinking it was going to be a waltz to a Super Bowl repeat. Sad loss though for now, 24-23. Week 15: Sunday, Dec. 18 at Chicago Bears, 12 p.m.
Coming off their first loss of the year, and ruining a chance at history, the Packers re-focus, both on offense, defense, and special teams. I expect Jay Cutler to be going through the motions by mid-December, as the Bears will stumble to about a 7-9 season. Their defense is going to be improved with the additions of some key guys via free agency, especially at inside linebacker. In Green Bay or Chicago, Cutler is sick of #52 crushing his ribs into the dirt. This dirt will be hard, frozen, in December. The Packers have won the last five regular-season games in Chicago, with their last loss being in that Super Bowl season of 2010 when the refs handed the game to the Bears by calling 18 ridiculous penalties on the Packers, including two that denied Packer defense a turnover and another where they swallowed the flag on a Hester punt return for a touchdown in which two Packers were shoved in the back. Bears defense puts up a fight, but the Packers prevail 23-16. Week 16: Saturday, Dec. 24 vs. Minnesota Vikings, 12 p.m.
Last year, the Vikings stole the NFC North from the Packers with their 20-13 win in the regular-season finale in which the Packers were reeling from being hammered in Arizona the week before, and with injuries along the offensive line. This year, depending on health, the Packers should return the favor here with normalcy, beating Minnesota 26-13 behind four Crosby field goals and two Rodgers-to-Janis touchdown passes. Somehow, this guy won at Lambeau last year, and it wasn’t against Seneca Wallace, TJ Rubley, Scott Tolzien, or even Matt Flynn. Packers clinch the #1-seed in the NFC, and questions again linger about who to play, who to rest, how much effort to give in a meaningless season-finale versus the Motor City Kitties, just like in 2011 when the Packers were also 14-1. That year, as you recall, Matt Flynn got the start and broke all the Packers records with six touchdown passes. This time…..
Week 17: Sunday, Jan. 1 at Detroit Lions, 12 p.m.
….This time, Aaron Rodgers doesn’t get de-activated and get rusty. He starts, but only plays the first half, propelling the Packers to a 17-7 halftime lead. Then second-year quarterback Brett Hundley finally gets some action. He struggles a bit, but also makes a few good plays. Packers rookie dynamo Jakeem Grant will break some ankles next year as a return superstar. He’ll also make a few big plays as a wide receiver, mostly in the slot mismatched on slower linebackers and safeties, but also in space on bubble screens in isolation. He gives the Packers their biggest special team weapon in 20 years, since Desmond Howard won the Super Bowl MVP. Rookie Jakeem Grant takes his second punt back for a touchdown on the season, to go along with one kick return touchdown. It earns him a Pro Bowl nod. And it helps the Packers get their 15th win and end the regular season on a high note. The Lions will be in hibernation mode by November. Don’t be surprised to see some new faces in Lions’ uniforms for this game, even perhaps at QB. Final score in Detroit is Packers 31, Lions 17. Victim #1- Arizona (who defeated Dallas in NFC Wildcard Rd) 31-0 shutout for Capers’ defense. Victim #2- Seattle (who defeated Carolina in NFC Divisional) 20-14 thriller. There won’t be Revis Island to escape from anymore, but Jordy will be back. Victim #3- New England (20-year anniversary since Super Bowl XXXI when Packers beat Patriots) by a 31-24 score. Super Bowl #5 for the Packers. Brady makes his 7th Super Bowl, dropping to 4-3, which is still sensational.